This copycat Starbucks Red Berry Cheese Danish recipe lets you enjoy the seasonal breakfast all year long. While there are plenty of cool indie coffee shops within Austin, where I live there’s only a drive-through joint and Starbucks. Since I work from home, once or twice a week I like to get out among real people. That means heading to Starbucks, so I can be nearby if either of my kids’ schools calls and I need to get them. I pretty much stick with an Americano, and every so often treat myself to one of the pastries. Over the summer I discovered the Starbucks Red Berry Cheese Danish: pastry topped with cream cheese and red berry jam. I normally don’t go for cheese danishes but my raspberry-loving heart was hooked. So of course, imagine how annoyed I was when I returned recently and saw they are no longer on the menu. Yep. Every time I fall in love with a treat, no matter the place, they swap it out with something else. Starbucks does seasonal baked goods, so it’s understandable, but I’m not gonna eat a salted caramel tart for breakfast, mmkay? I knew I had to try my own riff on these, and luckily I had just gotten a sample of Primo’s new Berry Pasilla preserves. While the Starbucks version is pure sweet and buttery, I knew the heat in these preserves would be just the right kick needed to bring the pastry up a notch. 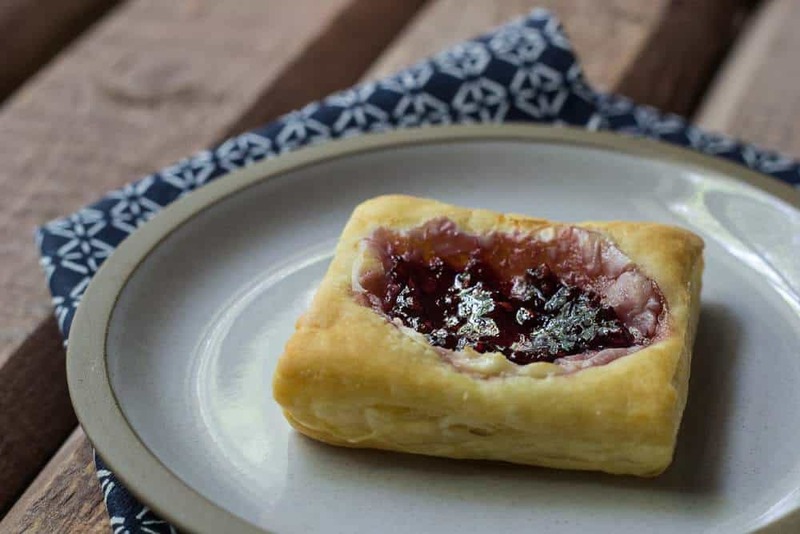 With the cream cheese and the flaky puff pastry, it makes for a great bite that doesn’t leave you overwhelmed with sweetness (my litmus test for a good breakfast pastry). Of course, you can use any red berry preserve you like, and decide if you want seedless or not. I prefer preserves that are more whole-berry variety, so seeds happen. If that’s not your thing, no problem! These are very similar to my Apple Tartlets, but are even easier! Their version uses croissant dough, but puff pastry works just as well for a buttery, crispy danish base. I like the Pepperidge Farm variety because it’s easy to find in stores, and the shape of the dough is perfect for nine tarts. If you prefer, swap in refrigerated crescent dough, but make sure you pick up the seamless sheets rather than the classic version. That way you will be able to avoid any odd shapes due to the pre-formed cuts. If you prefer savory breakfasts, try my Copycat Starbucks Breakfast Sandwiches, a riff on their bacon, gouda, and egg sandwich! Preheat oven to 400°F and line a baking sheet with parchment paper or grease muffin tin. Dust countertop and rolling pin with flour and roll out puff pastry gently. You can skip this step if you prefer. Cut pastry dough into equal squares - one sheet should make 9. Transfer squares to the parchment paper, or press gently into muffin tin wells. Spread 2 teaspoons of cream cheese onto each square, using the back of a spoon or an offset spatula to spread it to the edges of the circle. If using a muffin tin, just spread as evenly as you can in the pastry. Top the cream cheese with a dollop of preserves. Bake for about 20 minutes, until puffed and golden. Serve immediately. Leftovers can be stored for up to 2 days and reheated in a toaster oven or microwave. For more morning inspiration, check out my Breakfast board on Pinterest! Follow Megan Myers | Stetted’s board Breakfast on Pinterest.